We Are Chester writer and real ale aficionado Dyfan Morris reports on his first visit to the Cheshire Beer Festival. This popular event took place at Chester Racecourse and gave fans of ales, beer, ciders and perrys the chance to enjoy taking their pick from a wide variety of casks, while enjoying the company of likeminded people and live music to keep their toes a-tapping. 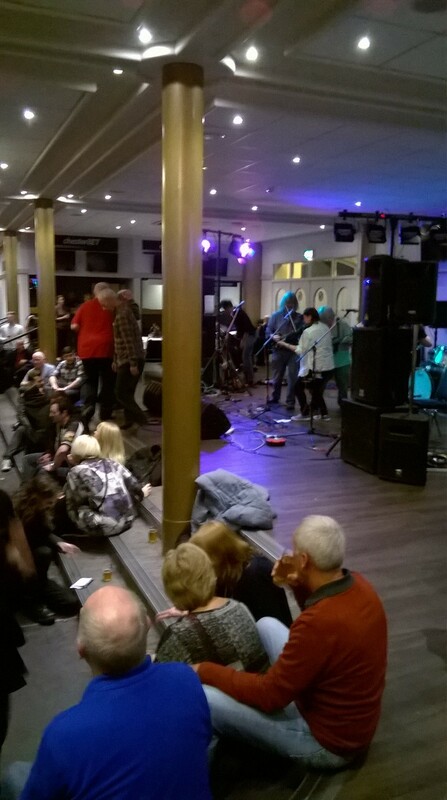 It was more than a little pleasing to walk into CAMRA’s 2015 Cheshire Beer Festival from the darkness of a winter’s evening at Chester Racecourse. In contrast to the wintry and silent ground, we were greeted by a cosy gathering of likeminded revellers, all of whom were enjoying their pints of ‘ambrosia’ to the sound of rip-roaring live music. Behind the make-shift bar were row upon row of casks, all of which dispensed some of the finest ales, beers, ciders and perrys our area has to offer. Behind this wall of barrels lay an astounding network of pipes that would not have looked out of place on a NASA launchpad. After finding a spot by the lovely traditional pub games, we carefully studied the beer list. The plan was fairly methodical and scientific (by our standards at least). We would start with lighter beers and then work our way through to the darker ones in the hope that the strongly flavoured porters and stouts would not overpower the taste of the more subtle brews that might otherwise follow them. This plan worked well for a while, however, after several strong beers we validated Robert Burns’ point about mice and men and their failing schemes. In the end we went for the ales with names we liked. It worked out very well. As you might expect from such an event, we didn’t come across a single duff brew. The food was good and very welcome by the time we felt that eating something was probably a good idea. I previously stated in a blog ahead of the event that food would be available from stalls, however this information was wrong. The meals were ordered in a dining area just to the side of the main room, they arrived quickly and were just what we needed before returning to the main event. It was an excellent night, made all the more enjoyable by the friendly atmosphere provided by the hardworking organisers and lovely people who attended it. I can’t recommend this festival enough and if you would like to attend it this year, it is advisable to book early as tickets sell out quickly. You can keep up with the latest news by visiting the following website: http://www.camracasc.org.uk/index.htm. Reblogged this on River Pumpkins.